Would you like to add a challenge to your reading life? There are a few reading challenges going on this year that highlight diverse lit. I have joined two that will help add more diversity to my year. Diversity on the Shelf is being hosted by Alysia at My Little Pocketbooks. She has provided an excellent list of resources for finding diverse lit and will be having link-ups throughout the year. She has a giveaway going on right now too. I have already started working on this challenge by reading Death, Dickinson, and the Demented Life of Frenchie Garcia by Jenny Torres, Amazing Peace: A Christmas Poem by Maya Angelou and Inheritance by Malinda Lo in addition to some children’s lit. I have started a Goodreads shelf and here you can also see any books shelved with the tag Diversity on the Shelf 2014 by other challenge participants. 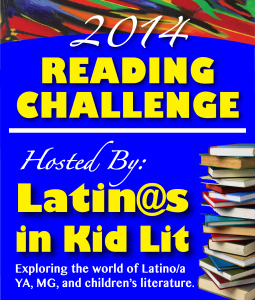 Another fun challenge is being hosted by Latin@s in Kid Lit. They are encouraging people to read children’s and young adult literature by or about Latin@s. They also provide resource lists and suggestions. There will be link-ups here also. When I started making my plan for what I would be reading this year, one of the lists I checked was the Best Multicultural Books of 2013 to see what I may have missed last year. The list was created by the Center for the Study of Multicultural Children’s Literature. Whether you join a formal reading challenge or not, I hope that this year you will be reading and supporting diverse young adult literature in any way that you are able. I wish you a fantastic year of reading! Thank you so much for the great post. I am going to check out the other challenge as well. Thanks and good luck on your reading challenges. Oh I’m so in on this!